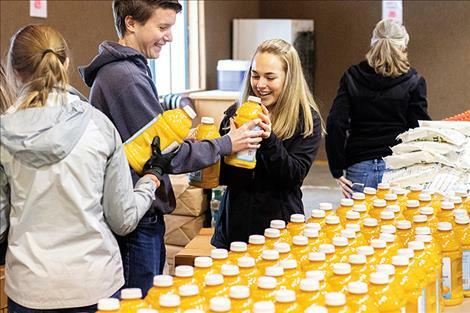 Bottles of juice provide nutrients for which some seniors may not have access due to limited funds. Fresh produce is also available during the spring and summer months through a Senior Farmers Market Coupon grant. Volunteers unload 15,000 pounds of food by hand. Honor Society students from Ronan High School put together 220 food packages headed to seniors all across Lake County. 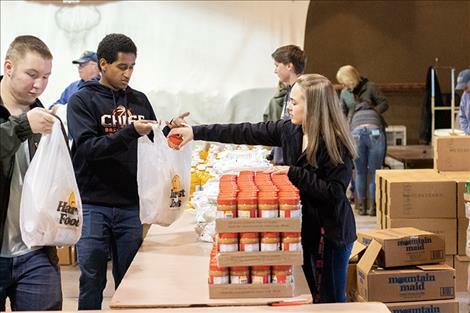 PABLO – About a dozen members from the Ronan High School Honor Society along with local volunteers worked together to prepare food packages for the Commodity Supplemental Food Program on the morning of Tuesday, Jan. 15. Managed through the office of the Lake County Council on Aging, the Commodity Supplemental Food Program is a federally-funded program with the U.S. Department of Agriculture designed to assist food-insecure people over the age of 60 years with a good mix of nutritious items to help supplement their food needs. 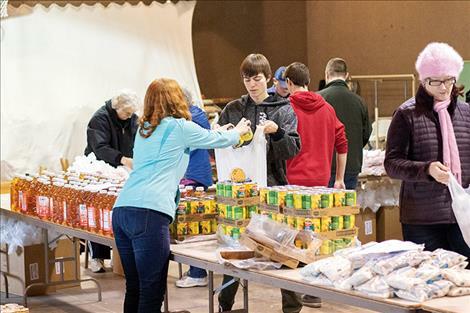 At the Pablo Christian Church gymnasium, ground zero for the operation, volunteers gather every other month to assemble the food packages that are to be distributed to the seniors. Unloading the truck by hand begins the process. A small group of workers break down the various food pallets on the truck and send them down the rollers. A much larger group of volunteers pick up, separate and organize the food items into the makeshift warehouse. 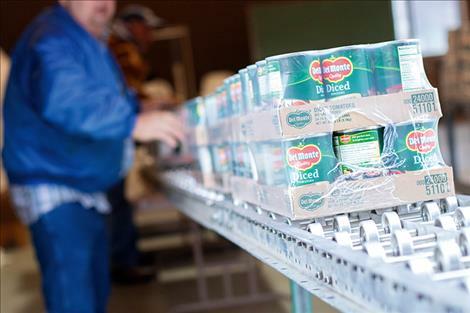 Once the truck is unloaded, the process of assembling the food packages begins. The volunteers divided into two groups to form an assembly line. One group handed out the food to another group of volunteers who were filling the bags. Over the course of the morning, the team sorted through an astounding 15,000 pounds of food and put together 220 food packages headed to seniors all across Lake County. Many seniors are living on a fixed income, but their expenses for everyday items like food, fuel and utilities continue to rise. All too often seniors have to make difficult choices, like choosing between paying for their medications or buying food. “The CSFP program helps vulnerable seniors from having to choose between food and other basic needs,” Rodda said. The food packages are intended to be a healthy addition to meals prepared at home when other food sources are running low. 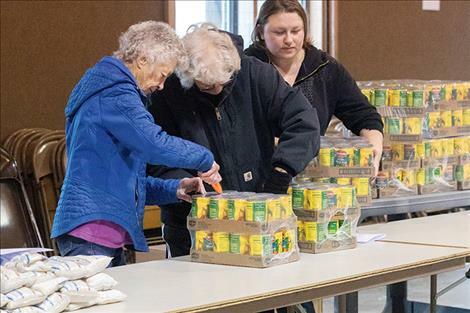 Seniors who qualify for the CSFP program pick up their package of about 70 pounds of food at their local senior citizen center once every two months. 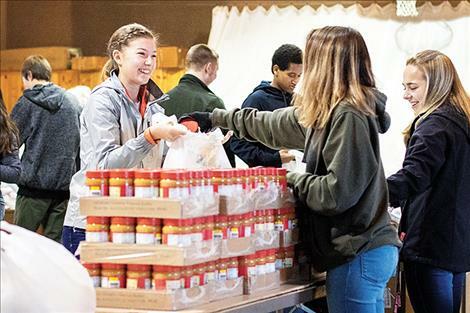 Participants may find non-perishable canned vegetables and fruit, hot or ready-to-eat cereal, pasta, a two-pound block of cheese, juice, dry beans, rice, peanut butter and canned meats. 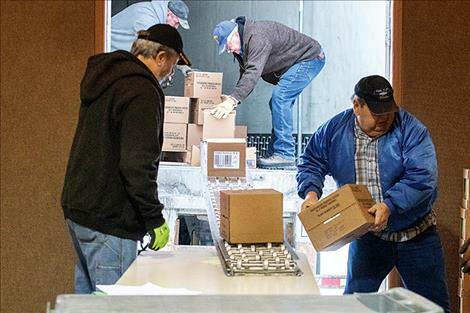 In addition to distributing a bi-monthly food package, the Lake County Council on Aging has expanded its outreach to include the distribution of fresh produce to seniors. To learn more about the Lake County Council and its programs, including volunteering and the CSFP program, visit www. LakeCountyCOA.org or call 406-676-2367.